Recently, I've been having several conversations about fried chicken ranging from KFC to Jollibee to 99 Chicken. So, I found myself driving over to Popeye's to see if they really had a more flavorful chicken than KFC. I picked up an order of a 3-piece dinner (even though it was lunch) of spicy chicken. It had pretty good crunch, but the chicken itself wasn't really seasoned - only the breading. So, in the end, I didn't actually think the flavor was superior to KFC - pretty much the same (assuming the KFC chicken is freshly cooked and not sitting under a heat lamp drying out for several hours). It might be more crunchy than KFC's Extra Crispy, but I don't weight that very heavily. 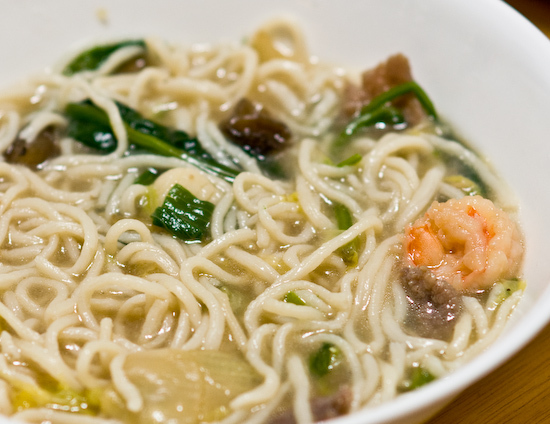 For dinner, I heated up the rest of the left over noodle soup from yesterday's Tong Soon Garden meal. I would agree, although I've only had Popeye's once. For a while Hardee's (don't know if Carl's Jr did it too, as I wasn't in California then) had fried chicken, and they claimed in all of their commercials that in a blind taste test people preffered it to KFC. …you just made me hungry for KFC. 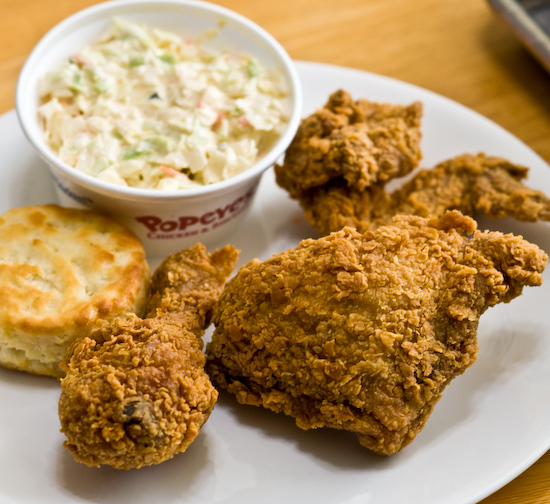 Popeye's crunchiness is the only reason I enjoy it - there are just times that texture is what I'm craving for. Have you been over to Jollibee's yet? Not yet. I might try next week.